The ISIL or IS threat is a smokescreen. The strength of the ISIL has deliberately been inflated to get public support for the Pentagon and to justify the illegal bombing of Syria. It has also been used to justify the mobilization of what is looking more and more like a large-scale US-led military buildup in the Middle East. The firepower and military assets being committed go beyond what is needed for merely fighting the ISIL death squads. While the US has assured its citizens and the world that troops will not be sent on the ground, this is very unlikely. In the first instance, it is unlikely because boots on the ground are needed to monitor and select targets. Moreover, Washington sees the campaign against the ISIL fighters as something that will take years. This is doublespeak. What is being described is a permanent military deployment or, in the case of Iraq, redeployment. This force could eventually morph into a broader assault force threatening Syria, Iran, and Lebanon. US-Syrian and US-Iranian Security Dialogue? Before the US-led bombings in Syria started there were unverified reports being circulated that Washington had started a dialogue with Damascus through Russian and Iraqi channels to discuss military coordination and the Pentagon bombing campaign in Syria. There was something very off though. Agents of confusion were at work in an attempt to legitimize the bombardment of the Syrian Arab Republic. The claims of US-Syrian cooperation via Russian and Iraqi channels are part of a sinister series of misinformation and disinformation. Before the claims about US cooperation with Syria, similar claims were being made about US-Iranian cooperation in Iraq. Earlier, Washington and the US media tried to give the impression that an agreement on military cooperation was made between itself and Tehran to fight ISIL and to cooperate inside Iraq. This was widely refuted in the harshest of words by numerous members of the Iranian political establishment and high-ranking Iranian military commanders as disinformation. 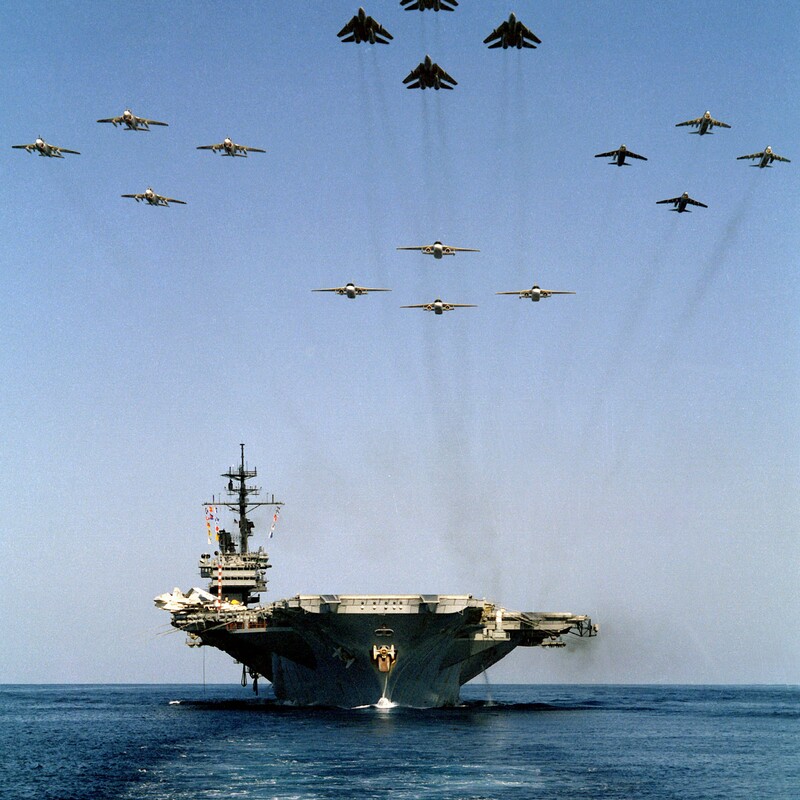 After the Iranians clearly indicated that Washington’s claims were fiction, the US claimed that it would not be appropriate for Iran to join its anti-ISIL coalition. Iran rebutted. Washington was dishonestly misrepresenting the facts, because US officials had asked Tehran to join the anti-ISIL coalition several times. Before he was discharged from the hospital after a prostate surgery, Ayatollah Ali Khamenei, the highest ranking official in Iran, told Iranian television on September 9, 2014, that the US had requested that Tehran and Washington cooperate together inside Iraq on three different occasions. He explained that the US ambassador to Iraq had relayed a message to the Iranian ambassador to Iraq to join the US, then, in his own words, «the same [John Kerry] — who had said in front of the camera and in front of the eyes of all the world that they do not want Iran to cooperate with them — requested [from] Dr. Zarif that Iran cooperate with them on this issue, but Dr. Zarif turned this [request] down.» The third request was made by US Undersecretary Wendy Sherman to Iranian Deputy Foreign Minister Abbas Araghchi. Khamenei additionally made it clear that he categorically ruled out any cooperation with Washington on the issue. «On this issue, we will not cooperate with America particularly because their hands are dirty,» he publicly confirmed while explaining that Washington had ill intentions and nefarious designs in Iraq and Syria. Like Russia, Iran has been supporting Syria and Iraq against ISIL. Also like Moscow, Tehran is committed to fighting it, but will not join Washington’s anti-ISIL coalition. New Invasion(s) and Regime Change Project(s) in the Pipeline? There were also two other unforgivable cardinal sins that Al-Malaki’s government in Baghdad committed in Washington’s eye. These offenses, however, should be put into geopolitical context first. Like Syria, Al-Malaki government’s cardinal sins were tied to blocking the pathway to Tehran. Firstly, the Iraqi government evicted the Pentagon from Iraq at the end of 2011, which removed US troops stationed directly on Iran’s western border. Secondly, the Iraqi federal government was working to expel anti-government Iranian militants from Iraq and to close Camp Ashraf, which could be used in a war or regime change operations against Iran. Ashraf was a base for the military wing of the Iraqi-based Mujahidin-e-Khalq (MEK/MOK/MKO). The MEK is an anti-government Iranian organization that is bent on regime change in Tehran. It has even openly endorsed US-led attacks on Iran and Syria. Although the US government itself considers the MEK a terrorist organization, Washington began to deepen its ties with the MEK when it and its staunch British allies invaded Iraq. Disingenuously and ironically, the US and Britain used Saddam Hussein’s support for the MEK to justify labeling Iraq as a state-sponsor of terrorism and to also justify the Anglo-American invasion of Iraq. Since then the US has been nurturing the MEK. Since 2003, the US has been funding the MEK. Washington has been protecting the MEK, because it wants to keep them on a leash as either leverage against Tehran or to have the option of one day installing the MEK into power in Tehran as part of a regime change operation against Iran. The MEK has literally become incorporated into the Pentagon and CIA toolboxes against Tehran. Even when the US transferred control of Camp Ashraf to Baghdad, the Pentagon kept forces inside the MEK camp. Eventually the MEK forces would mostly be relocated in 2012 to the former US base known as Camp Liberty. Camp Liberty is now called by an Arabic name, Camp Hurriya. Washington has not abandoned its dreams for regime change in Tehran. Is it a coincidence that the US and EU support for the MEK is increasing, especially when the ISIL threat in Iraq began to be noticed publicly? Six hundred parliamentarians and politicians from mostly NATO countries were flown in for a large MEK gathering in the Parisian northeastern suburb of Villepinte that called for regime change in Iran on June 27, 2014. Warmongers and morally bankrupt figures like former US senator Joseph Lieberman, Israeli mouthpiece and apologist Alan Dershowhitz, former Bush II official and Fox News pundit John Bolton, former New York mayor Rudy Giuliani, and French former minister and United Nations Interim Administration Mission in Kosovo (UNIMIK) chief Bernard Kouchner all met the MEK to promote regime change and war. According to the MEK, over 80, 000 people attended the regime change rally. Supporters of the insurgencies in Iraq and Syria were also present at the Villepinte gathering calling for regime change in Iraq, Syria, and Iran. Joseph Lieberman’s friend and fellow war advocate Senator John McCain was unable to make the trip to the Parisian suburb in Seine-Saint-Denis, but addressed the regime change gathering via video. Congressman Edward Royce, the chair of the US House Foreign Affairs Committee, also showed his support for regime change in Iran through a video message. So did Senator Carl Levin and Senator Robert Menendez. 19. Marc Ginsberg, the senior vice-president of the public relations firm APCO Worldwide and former US ambassador and US presidential adviser for Middle East policy. 4. Martin Vallton, the mayor of Villepinte. 4. José Luis Rodriguez Zapatero, the former prime minister of Spain (who was also visibly accompanied by his wife Sonsoles Espinosa Díaz). 7. Adrianus Melkert, a former Dutch cabinet minister, a former World Bank executive, and UN Secretary-General Ban Ki-moon’s former special envoy to Iraq. Not only regime change was talked about, but the cross-border crisis in Iraq and Syria was a major subject. Fox News gave the event special coverage. Just in July, the MEK’s leadership had condemned Iranian support to the Iraqi federal government in its fight against the ISIL, yet since the US had began to nominally fight the ISIL the MEK has begun to hold its tongue. Before the regime change gathering, the MEK’s leader Maryam Rajavi — who the MEK has designated as the president of Iran since 1993 — even meet with the puppet Syrian National Council’s leader Ahmed Jarba in Paris to discuss cooperation on May 23, 2014. 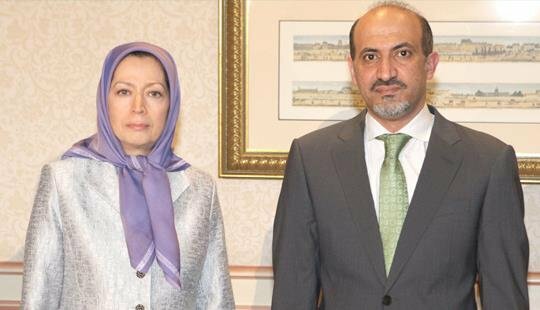 MEK leader Maryam Rajavi and SNC leader Ahmed Jarba meet to discuss cooperating for regime change in Tehran and Damascus. The bombing campaign that the US has started in Syria is illegal and a violation of the UN Charter. This is why the Pentagon took the step of claiming that the US-led bombing campaign was prompted by the threat of an «imminent» attack that was being planned against the territory of the US. This allegation was made to give legal cover to the bombardment of Syrian territory through a warped argument under Article 51 of the UN Charter that allows a UN member to legally attack another country if an imminent attack by the said country is about to take place on the UN member. Barack Obama and the US government have done their best to confuse and blur reality through a series of different steps they have taken to claim legitimacy for violating international law by bombing Syria without the authorization of Damascus. Although US Ambassador Samantha Powers informed Syria’s permanent representative to the UN that US-led attacks would be launched on Al-Raqqa Governate, informing Bashar Al-Jaafari through a formal unilateral notification does not amount to being given the legal consent of Syria. The US-led attacks on Syria do not have the backing of the UN Security Council either. The US government, however, has tried to spin the September 19, 2014, meeting of the UN Security Council that John Kerry chaired as a sign that the UN Security Council and international community are backing its bombing campaign. A US brinkmanship strategy to justify a US-led bombing campaign against Syria has been put into action with the intent of creating a pretext for expanding the illegal US-led airstrikes in Syria that started on September 22, 2014. While the US has been pretending to fight the same terrorist and death squads that it has created, the Chinese and their partners have been busy working to integrate Eurasia. America’s «Global War on Terror» has been paralleled with the rebuilding of the Silk Road. This is the real story and motivation for Washington’s insistence to fight and remobilize in the Middle East. It is also the reason why the US has been pushing Ukraine to confront Russia and the EU to sanction the Russian Federation. America wants to disrupt the reemerging Silk Road and its expanding trade network. While Kerry has been busy frightening audiences about the ISIL and its atrocities, the Chinese have been busy sweeping the map by making deals across Asia and the Indian Ocean. This is part of the westward march of the Chinese dragon. Parallel to Kerry’s travels, Chinese President Xi Jinping visited Sri Lanka and went to the Maldives. Sri Lanka is already part of China’s Maritime Silk Road project. The Maldivians are newer entries; agreements have been reached to include the island-nation into the Maritime Silk Road network and infrastructure that China is busy constructing to expand maritime trade between East Asia, the Middle East, Africa, and Europe. Nor is it a coincidence that two Chinese destroyers docked at the Iranian port of Bandar Abbas in the Persian Gulf to conduct joint drills with Iranian warships in the Persian Gulf. Parallel to east-west trade, a north-south trade and transport network is being developed. Iranian President Hassan Rouhani was in Kazakhstan recently where he and his Kazakhstani counterpart, President Nursultan Nazarbayev, confirmed that trade was due to see manifold increases. The completion of the Kazakhstan-Turkmenistan-Iran railway, which will create a north-south transit route, is being awaited. Cooperation between Tehran and the Eurasian Union was also discussed by the two presidents. On the other western side of the Caspian Sea, a parallel north-south corridor running from Russia to Iran through the Republic of Azerbaijan has been in the works. The anti-Russia sanctions are beginning to cause uneasiness in the European Union. The real losers in the sanctions in Russia are the members of the European Union. Russia has demonstrated that it has options. Moscow has already launched the construction of its mega natural gas Yakutia–Khabarovsk–Vladivostok pipeline (also known as the Power of Siberia pipeline) to deliver gas to China while BRICS partner South Africa has signed a historic deal on nuclear energy with Rosatom. An alternative to US and EU sanctions is beginning to emerge in Eurasia. Aside from the oil-for-goods deal that Tehran and Moscow signed, Russian Energy Minister Alexander Novak announced that Iran and Russia had made several new agreements worth seventy billion euro. Sanctions will soon merely isolate the US and the EU. The Iranians have also announced that they are working with their Chinese and Russian partners to overcome the US and EU sanctions regime. America is being rolled back. It cannot pivot to the Asia-Pacific until matters are settled in the Middle East and Eastern Europe against the Russian, Iranians, Syrians, and their allies. That is why Washington is doing its best to disrupt, divide, redraw, bargain and co-opt. When it comes down to it, the US is not concerned about fighting the ISIL, which has been serving Washington’s interests in the Middle East. America’s main concern is about preserving its crumbling empire and preventing Eurasian integration. Mahdi Darius Nazemroaya, «America pursuing regime change in Iraq again,» RT, June 20, 2014. Mahdi Darius Nazemroaya, «The Syria Endgame: Strategic Stage in the Pentagon’s Covert War on Iran,» Global Research, January 07, 2013. Scott Peterson, «Iranian group’s big-money push to get off US terrorist list,» Christian Science Monitor, August 8, 2011.